Reverend Jacob Fath succeeded Rev. J. C. Schwabenland and served the Ebenezer church from 1901-1903. He was born in Rheinbischofsheim, Baden, Germany on March 13, 1840 and he and his family immigrated to the United States in 1846 settling in Grandview, Iowa. 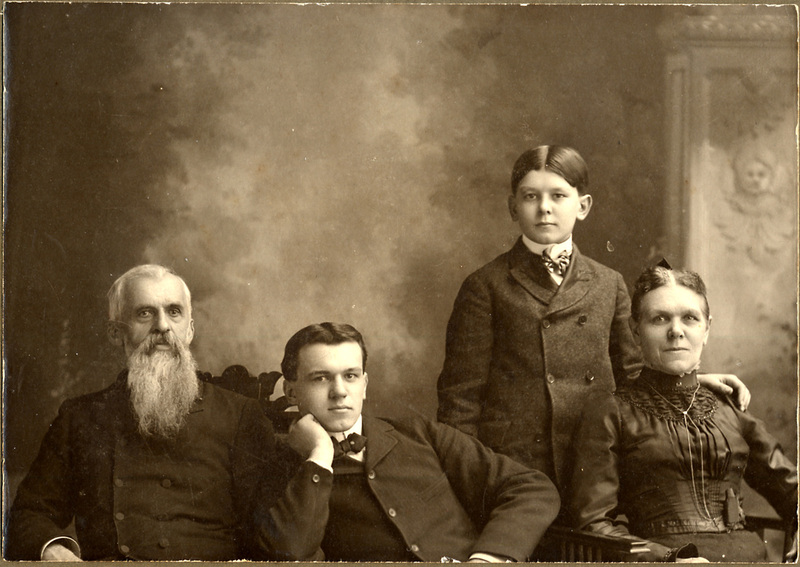 The Reverend Jacob Fath family. Rev. Fath is shown at the far left. The photograph was taken at the Townsend Studio located in Muscatine, Iowa and was provided courtesy of Linda Crain. In 1862, at the call of President Lincoln for six thousand men, Jacob Fath, then 22 years of age enlisted in Company 5 of the 19th Iowa Infantry to fight in the American Civil War. While serving in the Army he was converted and decided to become a soldier of the cross. His health broken, he returned to Europe in 1877 with his wife (the daughter of Rev. F. W. Judiesch), to study and regain his health. He spent two years training in Berne and Strassburg and preached in Germany and Switzerland until 1882 when he returned to America. Rev. Fath was called to serve in Pine Creek (1882-1894) and Muscatine, Iowa (1882-1899). He then served a financial secretary at Wilton College from 1899 to 1901 before his call to the Ebenezer church. Rev. Fath was said to be one of the most outstanding ministers in the German Congregational Church and his two and one-half years in Portland left a lasting impression on this congregation. After leaving Portland, Rev. Fath later served congregations in Des Moines and Treynor, Iowa. He died in 1922 at the age of 82. Eisenach, George J. A History of the German Congregational Churches in the United States. Yankton, SD: Pioneer, 1938. 283. Print.